… which very much could be over 100 years old! But it’s now to me!! 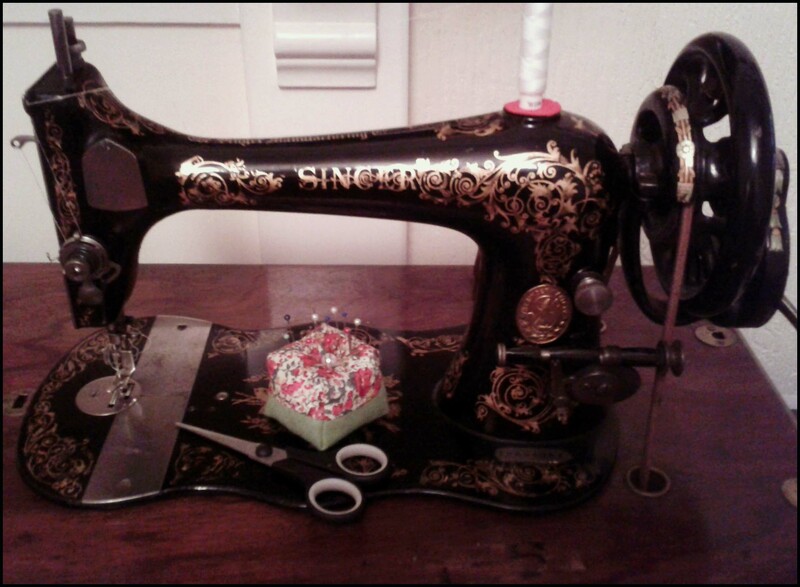 It’s my very first Singer Sewing Machine, and just how very beautiful is she? Delightfully worn and used, she treadles beautifully, but can disengage to be used as a ‘hand crank’ also. I haven’t used a hand cranked machine in a very long time- I learnt to sew on one when I was 5 or 6 but graduated to my Mums electric machine when I was found ‘batting’ the handle round to make it go faster!! To say I have a new found respect for my pre-electric counterpart is a complete understatement. After my Pfaff, this is a slow Sewing experience, and I found that after treadling for a while my foot feels like it is still treadling when I stop!! Very strange! I had however; forgotten the completely joyful sound of a non-electric Sewing Machine. These things jingle as they are used! I love it! Also pictured is my first Treadle Sewing Machine make… a dinky little Pin Cushion! As this- like all of my Sewing Machines- will be put to use for Bristol Sewing Club attendees (when I am confident I am happy teaching on it), and to make Costumes etc, I thought it would be a good idea to have a soft Pin Cushion as I would very much hate to mark the beautiful table it has come with. Now, I am trying to decide what I would like to make on it first! The idea of making a Victorian Corset is almost too tempting… what do you think? « Easter gifts and Sewing kits. Nipped into the café today and Maria told me to look here for your treadle. It is ridiculously gorgeous. You lucky cake. Also, you can lose hours of your life on this site deciding which decals you have. All the old Singer Vibrating Shuttles had the patent date of 1886 on the slide plate, but the serial number will give you the exact year of manufacture of your machine. Looking forward to seeing more pics, especially of the pretty flowers hiding under the pin cushion.